Two people have been injured in clashes between residents and Irish Water workers as protests against the new water tax have spread. Theresa Kelly was forced to seek treatment after she was knocked to the ground when a barricade was shoved into her by Irish Water workers on Wednesday. Ms Kelly was taking part in a protest in Raheny in northeast Dublin when the incident took place. She was taken by ambulance to receive treatment for a fractured elbow. Earlier this week, the Dublin government infuriated anti-austerity campaigners by confirming the annual charge for water will increase every year, beginning at an average 240 euro per annum per household. Support for the blockades, which see residents either block access or standing on footpath so that meters can’t be installed, has been at its strongest in Cork. There were clashes in two Cork estates last weekend with Irish Water staff arrived after 6am in an apparent attempt to circumvent ongoing blockades by residents. In Togher, resident John O’Donovan was also taken away by ambulance after he was seen to be struck by an Irish Water employee. Sinn Fein local election candidate Donnchadh O Laoghaire said the incident was “shocking”. “There were a number of quite serious health and safety issues,” he said. “Most seriously, I witnessed an incident involving an Irish Water contractor which left a man injured and requiring an ambulance. “I witnessed this personally, gardai have taken my contact details, and I hope to be invited to make a statement on the matter in the coming days,” Mr O Laoghaire added. There were also clashes between protestors and Irish Water workers at nearby Ashbrook Heights. Brian Gould of the Ballyphehane and South Parish Anti Water and Property Tax Campaign said the unpleasant confrontations would not distract from the message of the campaign. In Dundalk, Republican Network for Unity in Dundalk called on communities, members and supporters in the town to unite to oppose the latest austerity charge. Local activist Anne Dougan said a number of areas in County Louth have already been prepped for the installation of water meters. “As a republican socialist organization we are calling for all communities to unite in order to defend their basic human rights,” she said. In a statement, eirigi said that the people of Ireland “are not yet broken” and that communities are still willing and able to fight against injustice. They offered to help homeowners resist the new charges. 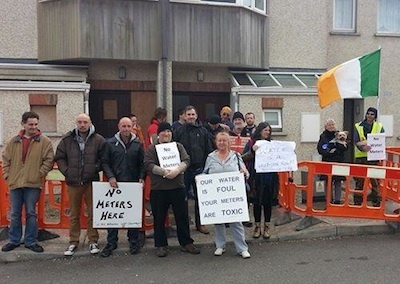 “Communities in Cork and in Dublin North East have shown the way with their active blockades of Irish Water’s efforts to install meters in their areas. Over the coming days and weeks it must be hoped that other communities will follow their lead”. They also warned that plans appear to be well advanced to introduce water charges in the Six Counties. eirigi representative Padraic Mac Coitir accused the Six County Department of Regional Development and ‘NI Water’ of deliberately misleading the public about ongoing works in Belfast, where installations are already underway outside hundreds of homes. “Equipment, known as boundary boxes, is being installed outside individual homes. These boundary boxes are essential prerequisites for water meters as they incorporate a concentric water meter manifold,” he said.